Highly perfumed Bouvardia are best suited to warmer climates, a tender shrub they do not survive frosts and cold winters. They also need protection from strong winds. A number of varieties are available from wholesale growers. Bouvardia longifolia is perhaps the most popular, with Bouvardia longiflora humboltii and its fragrant pure white flowers being very popular. In a sheltered warm position they are an excellent shrub to provide fragrance and perfume. Widely grown for cut flowers, sometimes said to be difficult, however not so in the right climate. 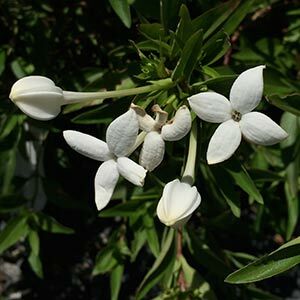 Bouvardia with its fragrant white flowers would be a number one choice on every gardeners list if they lived in a warm climate. The species that is sought after is B. longiflora, and although it will reach around 1m (3ft) in height it is easily pruned. B. longiflora ‘Humboldtii’ is also offered by some nurseries. It is the pure white, fragrant flowers from summer through to autumn that are the attraction, along with the perfume. You do need not only the climate, but also the right position. Bouvardia require a humus rich moist soil, good drainage and a warm sunny position. It also needs a position where it is tucked away out of the wind. Bouvardia has very brittle stems and is easily damaged by winds. Prune regularly to maintain a compact growth habit. If all of this seems a little to difficult, this is a plant that grows well in a container on a sunny and sheltered patio, so maybe it is not such a tricky plant after all.